Allows you to look up online chat acronyms and abbreviations. Is there a better alternative to Chat Slang Dictionary? Is Chat Slang Dictionary really the best app in Vertical Markets category? Will Chat Slang Dictionary work good on macOS 10.13.4? The Chat Slang dashboard widget allows you to look up online chat acronyms, abbreviations, and other slang terms directly from the Mac OS X Dashboard. Each slang term includes a popularity ranking, additional information about the term, and an example of how it is used. The Chat Slang widget can also be used to look up meanings of text-based emoticons. You can search for emoticons by entering either an emoticon meaning or the smiley face itself. 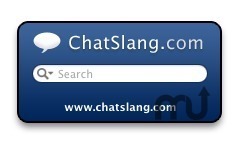 Redesigned for the new ChatSlang.com. Chat Slang Dictionary needs a review. Be the first to review this app and get the discussion started! Chat Slang Dictionary needs a rating. Be the first to rate this app and get the discussion started!